PizzaVia.hu - Every day, if you are hungry! 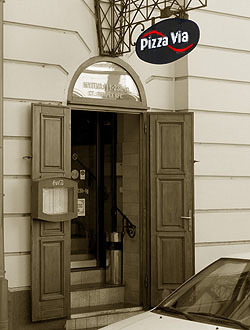 PizzaVia.hu, an elegant but familiar restaurant can be found in the heart of Debrecen, at 2 Arany János Street. It was established in 1999. We welcome our guests with wide range of foods and drinks, pizzas, fine pastas, soups, grilled and wok specialties, and interesting desserts. A fast lunch? A meeting with friends? If you don't have enough time to come by, Pizza Via makes it easy to get your favorite food fast. Please register to create an account, and use our online ordering system. At the first order you have to give us your name and delivery address. All of your personal information is safely stored in your profile until you update them. If you already have an account, please click here! Order, and wait for the delivery driver!